Went up to allotments at 10am to meet Clare. Bumped into Elaine first, and had a nice chat about how the council is dealing with the new allotment website. Told her about the amazing coincidence with Clare on the allotments. Clare then appeared and I introduced her to Elaine then both of us went up to look at my plot which is looking a little sad now. Despite this there are still some cabbages, and some reasonable leeks. The leeks are not getting any bigger, which is a shame, but then we haven't had much rain. We then walked across some grass covered plots uphill and found ourselves on the top half of the Cameron road site. Clare's allotment is one of all of those. The view from the top was quite amazing. Took photos. Clare showed me the tea chests she was using for compost bins and showed me where she was hoping to dig that day. Gave her my my old rake, and hoe. It certainly makes some room in the shed for other things. Went back to my plot and started planting the new onions. 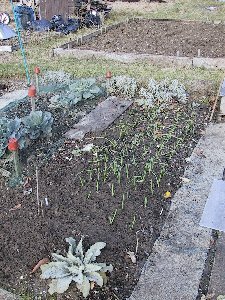 I now have planted all the autumn onions, and the first punnet of garlic. Most of these are Marco, but one row of them are the Thermidromes. Now all I have to do is wait until the next batch is ready to be planted. These are more Thermidromes and all the main batch of strong flavoured garlic which I think are Cristo. Off to the pre-Christmas Chenies sale and firework display. Managed to acquire a few bits including a large bag of narcissus ‘geranium' bulbs and 10 crocus at half price. Dunno where I'm going to put them! Also got a handle for the Wolf garten stuff so I can use the hoes as hand hoes. Here we go again. This one really is grass-covered and so it´s very much a start-from-scratch plot. Finally it was dry enough to get up to the allotments and see what was going on. Soggy but reasonably pleasant. Intended to do a grand inspection tour of the old and new plots, but couldn't resist having a go at the beanpoles. Removed all of them and stuck the haulms in a pile. Covered them with the plastic sheeting to keep them at least partially dry, then peeked under the carpets to see what was happening. Nothing. Beautifully clear. Where there isn't carpet there's a lot of weeds germinating happily in the mild damp conditions. Could do with having a good hoe - just not when it's quite as soggy! Decided to try and get some of the sweetcorn haulms out too, and found the minipops have extremely healthy root systems still, which didn't want to come up! Did one row. Three to go. Up at the new plot, found it was even more grassy than I'd thought. It will take some time to reclaim I think. However it is indeed the one by the tap and it does have raspberries and the infernal wild brambles at the far end. 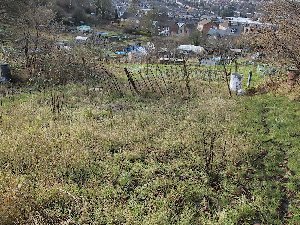 The website for the Chesham allotments is now live! A gorgeous, freezing cold winter day, perfect for spending in an allotment. Took my border fork and hand tools with me (as well as a flask of tea!) and alternated between digging out things (sweetcorn, dandelions) and hand weeding. The sweetcorn took some doing, as the roots didn't want to give way, but there is now a pile of haulms on one of the pieces of carpet. Weeded the bed and removed the remains of the custard marrow. Then moved onto the summer onion bed, and weeded that. This one was covered with groundsel, and there's still some in between the leeks, but as they are sensitive to root disturbance, I left the smaller, harder to get out weeds behind. That now looks very much better. Decided I might as well go for broke and get the marrow bed weeded too, which wasn't too strenuous to my back as all the weeding was done either kneeling or sitting on fleece. Disturbed a woolly bear caterpillar while I was at it, but it uncurled and crawled off after a while. Think it was the getting much rarer Garden Tiger Moth, which is one of our more stunning moths. Here's hoping this one managed to hide before the blackbirds noticed. Pruned one of this summer's star blackcurrant bushes back to almost all new growth, so that bush is pretty well totally rejuvenated now. The prunings yet again will become cat deterrants… Now all I have to do is get some more carpet and it will all stay neat. I will have to work out what to do with the haulms, though if plan B comes off, I'll have plenty of space. 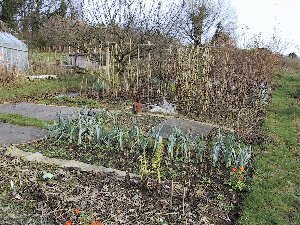 View over the veg plot after today´s efforts. Need more carpets! Popped home for lunch and then went back out to catch Chris, so discussed the new plot (and whether there isn´t a better alternative). There may well be... assuming the rumour I´ve heard is true. Managed to confirn the rumour at Church later, so I think I´ll be phoning the council again tomorrow.